"Gold Coin" redirects here. For information about the golden coins that appear in Super Mario Land 2: 6 Golden Coins, see Golden Coin. For the golden coins found throughout the Mario franchise, see Coin. "10 Coin" redirects here. For information about the coins from other Wario games and several Mario games, see 10 Gold Coin. For the Red Coins known as "10 Coins" in Mario Hoops 3-on-3, see Red Coin § Mario Hoops 3-on-3. Four different kinds of coins can be found in the Game Boy Advance game Wario Land 4. If Wario opens a Jewel Piece Box, a Gold Coin will appear along with collecting a Jewel Piece. They can also be obtained from a Heart Box and a CD case. 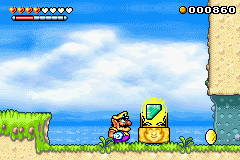 Wario can also retrieve Gold Coins by destroying a Pinball Block. Silver Coins can be obtained by defeating powerful enemies. Other, less valuable coins (like the Bronze Coin and Small Coin) can be obtained by defeating minor enemies and breaking blocks. Coins can also be obtained from a Money Flower. The blue and red coins that sit unmoving in the air are called Blue Crystals and Red Crystals. All coins collected are put to the side after completing a level and can be spent later in the Mini-Game Shop, where Wario can play one of three minigames. If he gets a certain score in any minigame, he will be awarded a medal, which can be used to purchase items from the Item Shop to assist him in defeating a boss. There is also a Diamond, which is not a coin but worth noting for it is worth 1000 coins. ↑ 1.0 1.1 1.2 1.3 1.4 1.5 Wario Land 4 American instruction booklet, page 27. ↑ 2.0 2.1 2.2 2.3 2.4 2.5 Wario Land Advance: Yōki no Otakara Japanese instruction booklet, page 23. This page was last edited on June 10, 2018, at 09:22.